08:47 Welcome to AUTOSPORT's live coverage of final free practice for the Monaco Grand Prix. 08:48 Just over 10 minutes until FP3 gets underway, and after some heavily disrupted running on Thursday (it always feels weird typing that instead of Friday) the workload teams will want to get through this morning will be bigger than ever. 08:50 Rain in FP2 on Thursday prevented anyone from doing the usual work of trying the super-soft tyre to gauge one-lap pace, before switching to long runs in preparation for Sunday. It'll be impossible for the teams to make up that FP2 programme entirely, but the first 45-50 minutes of FP3 represents their only chance to get some of that crucial work done before qualifying later today. 08:51 There was some dry running on Thursday, of course, but surprisingly cool temperatures meant it was taking the drivers sometimes as many as 10 consecutive laps to get the soft tyre (which is the harder of the two being used this weekend) up to a decent working temperature. 08:54 It's overcast out there again today, but temperatures are a few degrees higher than the troublesome low figures we saw on Thursday. Air temperature is 18C, and track is 24C. 08:59 Cars are already heading down the pitlane to wait for the green light. 09:00 The session starts, with Ricciardo leading a queue of cars out of the pits. 09:00 "Do you want many radio checks around the lap?" Ricciardo asks. He's told there's no need - "Just get on with it mate." 09:01 13 cars out on track already, and by the looks of it the two Manors have started this session on super-softs. 09:02 And unless we're getting some shoddy data, Rosberg is also on super-softs to start FP3. Only Kvyat and Bottas yet to take to the track. 09:03 Make that both Mercedes drivers on super-softs. So the top team and the bottom team have gone for an alternate tyre strategy to begin with. 09:03 Sainz is the first to set a lap, but he's quickly usurped at the top by team-mate Verstappen and the Force India of Perez, who tops the times with a 1m21.129s. 09:04 "Full throttle in the tunnel please," is the instruction to Massa. 09:05 Hamilton's first super-soft lap puts him comfortably fastest with a 1m19.074s. 09:06 We're yet to see a representative time from Rosberg in the other super-soft-shod Mercedes. 09:06 Traffic is already proving to be a problem with 15 cars currently on track. 09:06 Plenty of cars have already set times - Hamilton leads the way from Kvyat, Massa, Grosjean, Hulkenberg, Bottas. 09:07 Maldonado slots into second in the Lotus, seven tenths down on Hamilton. 09:07 Kvyat is reporting "quite big turbo lag" on these early laps. 09:08 1m17.504s for the world champion, and Rosberg appears in P2 with a 1m18.356s. 09:08 Yet to set a time: Ricciardo, Raikkonen, Alonso, Button, Vettel. 09:09 Grosjean, already P3, improves to go from +1.9s to +1.4s adrift of Hamilton. There's nothing surprising about a Mercedes 1-2, but Hamilton and Rosberg remain the only frontrunners to have got going on super-softs. 09:10 Rosberg is under 1m18s now too - 1m17.913s to be 0.4s behind Hamilton. 09:10 Replays show that Grosjean had a massive lock-up into Mirabeau. 09:10 Another improvement for Hamilton - he's found another half a second to post a 1m17.021s. 09:11 From trackside, BEN ANDERSON reports that he saw smoke from Button's McLaren earlier - just like he did on Thursday. It cleared itself before, but we've not seen much of Button so far. Ah, here he comes, leaving the pits again. 09:12 Kvyat also had a lock-up just now and had to straight-line the chicane. He had been complaining about brake difficulties. 09:13 The Mercedes drivers have been taking turns to let each other through. That's awfully polite - and it also could be that neither wants to lead the other around and give away any tricks! 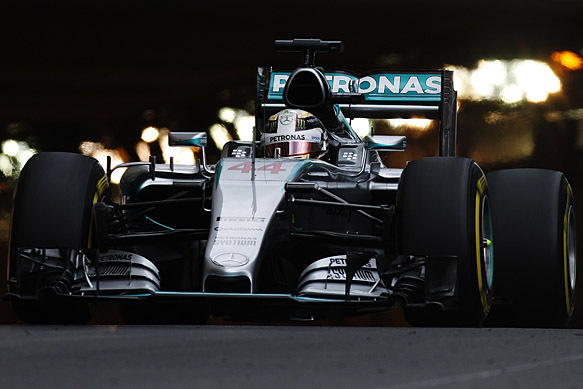 09:14 Another improvement for Hamilton - 1m16.705s, and Rosberg is next through with a 1m17.271s. Kvyat is currently best of the rest (on softs) with a 1m18.681s. 09:14 Hamilton is clearly pushing hard with the Mercedes bouncing around through the chicane. 09:15 Hamilton is told to do another lap, and he responds that the tyres won't deliver that. He's reminded that the team still needs him to do that extra lap for the test it is running at the moment. 09:15 Rosberg is complaining of too much oversteer in low speed corners at the moment. 09:16 Both Mercedes drivers pit, having each completed 10 laps on that super-soft run. 09:16 We're already a quarter of the way through FP3 (time is flying with the track being so busy). 09:17 Raikkonen is the only driver yet to set a time. 09:17 And as we say that, the Finn pops into P3 behind the Mercedes with a 1m18.406s. 09:17 That puts Raikkonen +1.7s to Hamilton's super-soft best. 09:18 Vettel improves on his second flyer to briefly take fourth, but the Ferraris are then split by Ricciardo. 09:20 Thursday stars Verstappen and Sainz top the lap count so far with 14 apiece, but after their heroics in FP1, the Toro Rossos are having a more conservative start (perhaps fuel-related), currently 16th and 17th. 09:20 Another improvement for Button, he's up to seventh. 09:21 Still only Mercedes and Manor have used the super-soft tyre. It's not often those two have much in common! 09:22 "I think we should box and try the other tyres," says Raikkonen. "OK Kimi, understood. It's quite early in the programme, but no problem." He'll be in for super-softs shortly, then. 09:23 Vettel is another driver who has straight-lined the chicane. The German made no attempt to try to get the Ferrari round the corner. 09:23 BEN ANDERSON describes Vettel's approach to the chicane so far in this session as "basically rally driving", even before that error. 09:24 The McLarens, Force Indias and Maldonado all take to the super-softs. 09:24 Raikkonen is in the pits, so the tyre change he requested is probably imminent. 09:24 Sure enough, the Ferrari heads back out on the red-sidewalled tyres. 09:25 Mercedes continues to be different - Rosberg appears for his first laps on the soft tyre just as everyone else is switching to the super-soft. 09:26 So, Raikkonen, with a tyre-compound disadvantage, is currently 1.3s adrift of Hamilton. Let's see how close he gets on the same tyre, bearing in mind he'll have the likely advantage of a slightly cleaner (and possibly warmer) track surface. 09:26 Hulkenberg's first super-soft lap moves him up to P4. 09:26 Button slots in behind Hulkenberg on his super-softs - both are in the low 1m18s. 09:27 Raikkonen finds six tenths on the super-soft. 09:27 Alonso was charging on a lap but then got held up by one of the Ferraris, prompting the Spaniard to gesticulate at the red car in frustration. 09:28 Raikkonen hits the wall at Ste Devote. 09:30 Replays suggest Raikkonen lost the back-end midway through the corner and glanced the barrier. 09:30 Effective work from the Monaco marshals (as ever) and the session is green again. 09:32 The Finn had just set his fastest lap before that crash and now has the honour of being the first driver to hit the Ste Devote wall this year. 09:32 "We hit the barrier and punctured the tyre instantly," Raikkonen was told on the radio. 09:33 Track time is still precious this morning, so plenty of cars have headed straight back out. Only Red Bull and Mercedes are using the harder tyre at the moment. 09:35 That red flag will have disrupted lots of drivers who were just winding up to get some quick laps in on the super-softs. The Mercedes drivers managed to keep improving over the course of their 10 laps on the softer tyre earlier, with the obligatory cool-down laps in-between, of course. So it'll be more than a one-shot for those who have headed back out on the red-marked tyres. 09:35 Kvyat is told that "temperatures steadily rising" as he tries to bring the harder tyre into range. 09:37 Over at the chicane, BEN ANDERSON reckons a lot of drivers are looking for "front grip that isn't quite there yet". 09:37 Verstappen moves up to fourth on super-softs. 09:37 Rosberg is told that he is on his last timed lap. Will he be coming back in to switch back to super-softs for some qualifying simulations? 09:38 Vettel splits the Mercedes - he's +0.180s to Hamilton. 09:39 Rosberg's last lap on these soft tyres is actually an improvement on his super-soft lap from earlier. But it's still not enough to get back ahead of Vettel. 09:39 Verstappen has hit the wall at the final corner. 09:40 He spun mid-way through and glanced the barrier with the back of his Toro Rosso. 09:40 Hamilton's had a scary moment at the chicane. BEN ANDERSON reports that he locked the rears under braking, and had to take to the escape road to gather the Mercedes back up. "A change of brake bias and some new underwear required," is the verdict from trackside. 09:41 Verstappen's rear-wing is damaged but he returns to the pit at a surprisingly quick speed. 09:41 Rosberg has re-appeared still on softs as we enter the final third of FP3. 09:41 It's just the end-plate that Verstappen was missing. 09:42 Ferrari: "Kimi back to the garage analysing data"
09:43 Ricciardo moves up to fifth, best of the rest behind Hamilton, Vettel, Rosberg, Raikkonen. 09:45 The Saubers are currently topping the speed trap figures, with the top Mercedes-engined driver Massa in fourth. 09:46 That's not helping the blue cars though as they are currently 16th and 18th. 09:47 Another improvement for Ricciardo, down to a 1m17.540s, but he stays fifth behind Raikkonen. 09:49 Rosberg - back out on super-softs - is told to expect rear overheating and oversteer on his second quick lap. 09:50 Less than 10 minutes to go, let's see what improvements people are going to make. 09:50 Ericsson just went into Ste Devote way too fast - perhaps explained by the Sauber's superior straightline speed - and went down the escape road. 09:51 Ricciardo is first to move - he's up to P3 and only 0.4s adrift of Hamilton at the moment. 09:51 Kvyat puts the other Red Bull sixth, 0.3s behind Ricciardo and 0.7s slower than Hamilton. 09:52 Hamilton is building up very slowly on this run. Let's see what he's got when he unleashes his pace on a track that will be in much better condition than when he was last out on the super-soft. 09:52 Rosberg gets to +0.065s behind Hamilton. 09:52 Ricciardo is asked if he wants to do another lap - he says he can, but he probably won't go quicker. 09:53 Hamilton gave away 0.4s in sector one on this lap, but he's had a very good second sector. 09:53 The world champion crosses the line 0.1s down on his previous best. 09:54 Hamilton is complaining of "less grip" than earlier. He's informed that his tyre temperatures are a little on the high side, which could be the explanation. 09:55 Vettel is on a quick lap, fastest through sector one. 09:55 Hamilton's latest lap is 0.2s slower than his best from earlier, so he's not quite getting as much out of the super-soft tyre as he managed early in the session. 09:56 Vettel is flying through sector two as well. 09:56 P1 for Vettel - 1m16.143s puts him 0.562s clear of Hamilton. 09:57 So while Hamilton is unhappy with his car compared to earlier on in FP3, Ferrari has found something with three minutes to go. 09:58 Rosberg moves ahead of Hamilton as well, but he's 0.2s down on Vettel. 09:59 Alonso is told that he has time to do another warm-up lap to get him in-sync with the other cars that are out there scrambling for clear track. 09:59 Perez almost piled into the back of Vettel as the Ferrari entered the pits. The Mexican narrowly avoided both Vettel and the barriers. 10:00 That's it, the flag is out and FP3 is over. 10:00 A whole queue of cars are backed up round the final few corners. 10:00 Button sneaks into the top 10 at the death, he's up to eighth. 10:01 Sainz is another to improve at the end - getting the Toro Rosso up to fifth. 10:01 Hamilton is still unhappy, and he's reassured that his troubles were probably simply down to tyre pressures being too high. 10:02 While Sainz and Button were able to improve, several drivers lost out on the chance to set another quick lap by getting caught in a traffic jam of cars backing off in the final sector. 10:04 The drivers are now all doing practice starts on the grid. 10:04 So, that looked like a good session for Vettel, the Red Bulls, Sainz, and even Button. 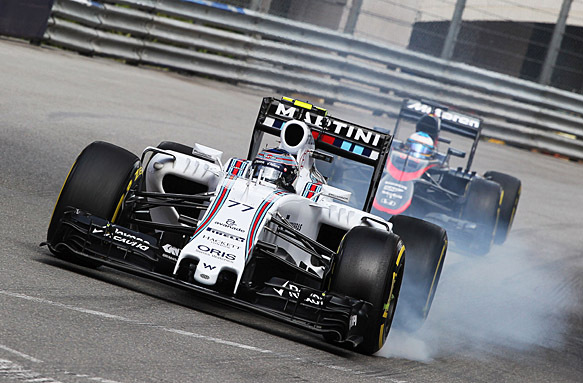 It will be interesting to see what Williams and Sauber have in reserve, with their cars occupying positions 15-18. 10:23 We'll be back in just over an hour to start building-up to qualifying, which gets going at 1pm UK time. See you then! 11:44 Here we go then. The countdown to qualifying for the Monaco GP is on. 11:46 It's still pretty cloudy in the Principality, but there are small patches of blue sky, so there doesn't seem to be a huge threat of rain at the moment. 11:48 It wouldn't be a huge surprise if this session turns into a Mercedes-only battle for pole, but Ferrari and Sebastian Vettel made a statement in final practice by setting the pace comfortably. Mercedes went for an alternative approach to FP3, starting on the super-soft tyre before switching to the softs briefly, and putting the super-soft back on for the end. But Lewis Hamilton and Nico Rosberg couldn't get it together in the closing stages, leaving the way clear for Vettel to catch the eye. 11:49 Hamilton, in particular, was baffled by a lack of grip on his final super-soft run compared to when he used the compound earlier in the session, but Mercedes tried to put his mind at ease by suggesting that it was simply high tyre pressures that affected his final run. 11:51 While a few drivers, notably Carlos Sainz Jr (5th) and Jenson Button (8th) were able to find clear track at the end, several others were forced to abort laps due to the amount of traffic that was building up in the final sector as people backed off to find clear space. That's only a potential threat for Q1 this afternoon, you'd expect, but it's yet another curveball that the teams have to deal with on the twisty streets of Monaco. 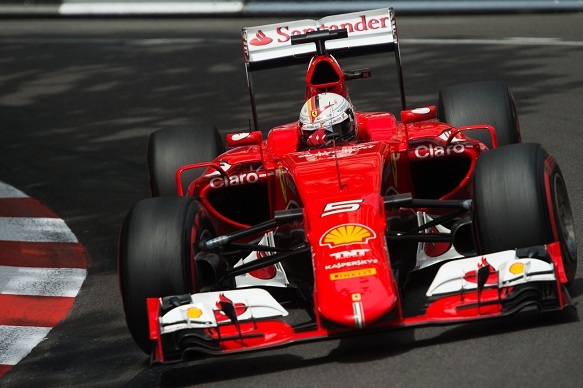 11:57 Raikkonen was the high-profile victim of the Monaco barriers earlier. The Finn got slightly out of shape at Ste Devote, tapping his left rear on the barrier and coming to a halt shortly after. The damage wasn't much, although the contact did immediately puncture his tyre. 11:59 Drivers head down the pitlane ready for the Q1 green light. 12:00 Monaco qualifying begins with the Toro Rossos, Ricciardo, Stevens and the Williams straight out. 12:00 Both Mercedes are quickly out of the pits too. 12:01 Sauber and Manor, the teams that occupied the bottom four places in FP3, all head straight out on the super-softs. 12:01 Hanging back in the pits for now: the Ferraris, Force Indias and Alonso. 12:01 The Toro Rossos and Williams drivers are all messing about in the final sector trying to get clear track. 12:02 That won't be the last time we're on traffic watch in the final sector. 12:03 Verstappen sets the initial pace with a 1m19.803s, much faster than anyone else's early efforts. 12:04 No one is within 4.2s of Verstappen at first, then Maldonado goes second with a time 0.6s down. 12:04 @MercedesAMGF1: "Very difficult to find a gap at this track! Anything can happen; important to get a good lap in early doors"
12:04 "Tyres still need five degrees so keep pushing," Sauber tells Ericsson. 12:04 Verstappen is going faster still, lapping in 1m18.651s, but Vettel and Hamilton are on quick laps too. 12:05 Vettel goes 0.3s faster than Verstappen with a 1m18.323s to take first place. 12:05 Hamilton blows Vettel's lap away with a 1m16.884s, that's 1.5s quicker than the Ferrari. 12:05 Rosberg goes second, but he's six tenths down on Hamilton. 12:05 Early pacesetter Verstappen is now down to eighth behind Ricciardo, Maldonado, Nasr and Kvyat. 12:05 Rosberg does the fastest first sector of all as he responds to Hamilton's first run. 12:06 Still yet to see the Force Indias or Alonso. 12:06 Rosberg's second and third sectors aren't quite so good, he finishes the lap 0.116s slower than Hamilton and still second. 12:06 Vettel improves but remains third, 1.013s off Hamilton. 12:06 "Do I have a gap anywhere?" asks an urgent Hamilton. He's told to let Ericsson through "and build the gap to him". 12:07 Raikkonen was down at the bottom among the Manors after his first lap but he's now up to eighth. 12:07 Sauber hasn't had a great weekend but Nasr has put himself seventh for now. 12:07 Hamilton is improving in the first two sectors after a cool-down lap. 12:08 Hamilton's third sector isn't so good but he still improves the benchmark to 1m16.588s. 12:08 Perez, Hulkenberg and Alonso are all on super-softs now. 12:09 Maldonado and Grosjean are next to take super-softs, with nine minutes to go in Q1. 12:09 The Force Indias and Alonso are the only cars yet to set flying laps but are out now. 12:09 Slowest five who've done times so far are Bottas, Ericsson, Button and the Manors. 12:09 Rosberg nips ahead of Hamilton, a 1m16.528s puts him on top by 0.06s. 12:10 Hulkenberg is told his tyres "look good", and he's told not to lose any temperature in them. 12:11 "Maintain track position, Dany," Red Bull tells Kvyat. 12:11 Hulkenberg's first lap puts him sixth, just behind that early super-soft banker from Nasr. 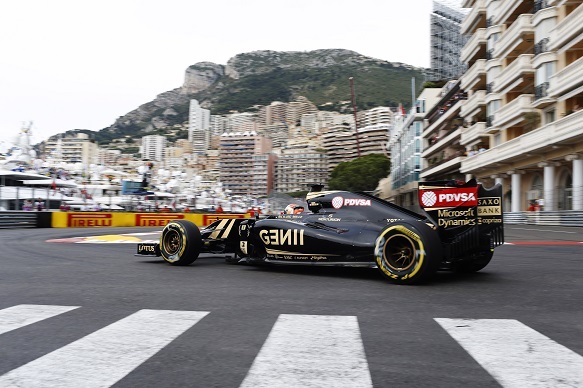 12:11 Maldonado improves to fourth, as Perez demotes Nasr and Hulkenberg with the sixth-fastest time. 12:11 Hulkenberg reports that he's hit the wall "at Turn 5", and he says he will get the car back to the pits. 12:12 Alonso built up slowly but now goes to ninth fastest. 12:12 Replays show Hulkenberg lost the rear-end on the way into Mirabeau, before tagging the left-rear wheel on the outside barrier. Force India will need to check that one out for damage. 12:13 Button leaps from the drop zone to seventh with four minutes left. 12:14 "Felipe there's a lot of traffic - we're going to need to find space to get these three laps in," Williams tells Massa. 12:14 Ricciardo was on a better lap that didn't end well and he stays 13th. 12:14 Verstappen is currently 12th but on a better lap. Everyone is on track except the Ferraris. 12:14 Sainz is under investigation for failing to stop at the FIA weighbridge. 12:15 Verstappen launches himself to a safe looking third. 12:15 Grosjean moves up from 15th to 11th. 12:15 Massa goes up from 16th to 11th. That puts Ricciardo down to 16th. 12:16 Nasr was sitting pretty in the top five not so long ago, but now he's down to 14th, ahead of Hulkenberg and Ricciardo. 12:16 Merhi is currently ahead of Stevens in the Manor battle. 12:16 Button moves to seventh, the in-the-pits Ferraris are now eighth and 10th with a minute left. 12:17 Ricciardo goes from 16th to fifth. Hulkenberg is now outside the cut-off. 12:17 @WilliamsRacing: "A bit of traffic on @ValtteriBottas' lap. It's very busy out there." 12:17 Stevens retakes 19th from Merhi by 0.3s. 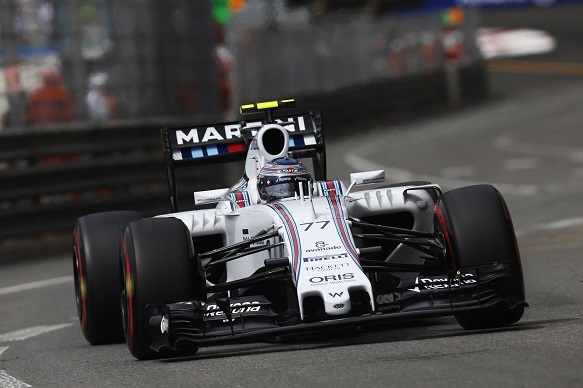 12:17 Bottas is struggling to get out of Q1 - he's still only 17th. 12:17 Hulkenberg edges up from 16th to 14th ahead of Alonso and Nasr. 12:18 The flag comes out - final chances now. 12:18 Bottas abandons his last lap and pits - he's out in Q1! He'll start 17th at best. 12:18 Ericsson is definitely out too, and so is his team-mate Nasr. 12:19 Williams to Massa: "That's it for us Felipe, thank you. Currently P12, box this lap." 12:19 McLaren to Alonso: "OK Fernando, we are safely through to Q2. Cool the car please." 12:20 Tyre-wise, Mercedes and Ferrari managed to avoid using super-softs to get through Q1. 12:21 Ericsson and Sauber are blaming Alonso for costing him three tenths, which by our maths wouldn't have got him through anyway. But it would have put him above Bottas on the grid. 12:25 BEN ANDERSON: "No surprise to see the Saubers exit in Q1. The C34 looks lazy around here. "Both Williamses had massive understeer in FP3 and it looks as though Bottas has not been able to cure that problem heading into qualifying on what was a weak circuit for the team last year too." 12:25 Q2 gets going, about half the field straight onto the track. 12:26 No time for soft tyres in Q2, everyone heading out on the red super-softs. 12:28 "OK Lewis, we need to pass through the pitlane to add the front wing, that was an error on my part,". Minor confusion at Mercedes for Hamilton, whose first run will be disrupted slightly. 12:28 All 15 cars in Q2 are already out, and Vettel starts the times with a 1m18.721s. Perez immediately beats that with a 1m17.592s. 12:28 Vettel's second lap is faster so far, he does the best first sector yet. Great middle sector coming in from Ricciardo on his first lap. 12:29 Ricciardo goes fastest with a 1m17.275s, but Vettel's lap suggest he'll be beating that any moment now. 12:29 Sure enough Vettel's back on top, lapping a second quicker than the Red Bull with a 1m16.224s. 12:29 "If you need to, there is a big gap behind Ricciardo, there's a big gap you can use," Mercedes tells Rosberg. The German sensibly asks if the Red Bull is on a lap, and is told he is. 12:29 Raikkonen and Kvyat pop into second and third places. 12:29 Alonso grinds to a halt at Ste Devote. 12:30 Good work from Alonso to park near a gap in the barriers, so his McLaren is quickly moved out of harm's way. 12:30 Verstappen goes second fastest, 0.8s slower than Vettel. 12:30 Alonso's first lap was a cautious 1m26s so that's a likely 15th place. 12:30 Meanwhile Button puts the other McLaren fourth. 12:31 Yet to see the Mercedes show their hands, but Rosberg is now fastest in sector one. 12:31 Raikkonen takes second place from Verstappen with a lap three tenths off Vettel. 12:31 Sainz and Verstappen put the Toro Rossos third and fourth. 12:32 Rosberg takes the top spot, his 1m15.471s lap is 0.8s up on Vettel. 12:32 Not so good from Hamilton on his first proper lap - he precisely equals Vettel's time and that means only third. 12:33 Raikkonen complains that he is struggling through Portier, the corner before the tunnel. He's got oversteer, and the team responds saying "we'll leave the front flap where it is," which gets a "Yep" in response from the Finn. 12:34 @MercedesAMGF1: "1:15.471 for @nico_rosberg! Wow! Quicker than last year's pole time. He's loving it out there." 12:34 Back to the pits for most drivers, time for fresh tyres and a last shot. The current 10th/11th gap is 0.012s between Ricciardo and Grosjean. 12:36 "Let's calm down and reset for this run," says Hamilton. "That was a really bad run, didn't get any gaps, and the tyres weren't in a good shape." The team takes responsibility: "That's my bad". 12:36 Grosjean pulls himself up from 11th to seventh. Ricciardo now outside the cut. 12:36 Maldonado, already in the top 10, improves to fifth. 12:37 Hulkenberg only manages to take 13th from Massa. 12:37 Perez jumps to ninth, which puts Button out of Q3 right now. Two and a half minutes left. 12:37 Ricciardo still can't do better than 11th. He's 0.045s off Grosjean ahead. 12:37 "What does 'two-timed' mean?" asks Rosberg. "One slow-timed, one fast-timed," he's told. "That's it." 12:39 Grosjean was improving until a rough final sector on that lap. He stays a vulnerable 10th. 12:39 "You're fine, good gap in front," Mercedes tells Rosberg. 12:39 Hulkenberg takes 13th back from Massa but Q3 looks out of reach. 12:40 Massa is only 14th again after his latest lap. 12:40 Ricciardo is still 11th as the flag comes out, but he jumps to seventh. Grosjean is out right now. 12:40 Grosjean pits, he won't follow Maldonado into Q3. 12:40 Rosberg didn't get to take advantage of that "good gap in front" - he's been down the Ste Devote escape road on his last flying lap. 12:41 Button doesn't find enough. The first sector - where yellows were out for Rosberg - was slow compared to the rest of the lap. 12:42 "Sorry about the yellow flag Jenson, that's P12." "Ohhhhh!" Button responds. "That's painful." 12:42 Hamilton did manage to improve and jump ahead of Vettel for second with his last Q2 run, but Rosberg was still 0.4s faster. 12:43 More Button: "That's seriously painful, that would have been eeeeeeasy. We were on for a reasonable result there." 12:46 Teams are reporting that there's rain in the air. 12:46 LAWRENCE BARRETTO: "Good effort from Sergio Perez, who makes it into Q3 for the first time this season in the Force India. The Mexican has had the edge over team-mate Nico Hulkenberg this weekend." 12:48 "Two laps, two laps, yeah?" Rosberg checks. 12:48 Q3 begins, expect a rush to beat the rain. 12:48 The Mercedes are straight out, Hamilton first on the road this year. 12:49 Hamilton looks all set for clear track then, and for now Rosberg is right on his tail. 12:49 @MercedesAMGF1: "Top 10 shootout, changing conditions, drivers on the limit, walls very close. This is where it counts..."
12:49 Only Maldonado is waiting back in the pits at the moment. 12:50 Rosberg waits until the approach to Rascasse to back off to give himself a gap. Hamilton didn't hang around on that outlap at all, and for most of it Rosberg was right with him. No messing about. 12:50 "Not raining at the moment," Sainz says. 12:51 LAWRENCE BARRETTO: "Lewis Hamilton said on Wednesday that he had the choice of whether to go first or second in Q3 after a coin toss at the start of the season - and he's decided to strike first with clear air. Rosberg has to back off and make space." 12:51 Hamilton's first effort is 0.4s faster than Rosberg, but their 1m20.6s and 1m21.0s are blown away by Perez's 1m17.912s. Just warm-up laps. 12:51 "Is he going for first-timed, is he?" Rosberg asks. "Yeah, we think he's pushing on the first lap," was the response, before Hamilton backed off at the end of that first effort. 12:51 Raikkonen goes second, but he's 1.9s off Perez. 12:52 Now Hamilton is on a proper lap and flies through first two sectors. 12:52 Hamilton claims provisional pole with a 1m15.304s. 12:52 Rosberg is 0.136s slower as he takes second. 12:52 Vettel goes third, half a second off the Mercedes. 12:52 Kvyat, Sainz and Raikkonen fill the rest of the top six for now. 12:53 Ricciardo takes fourth, then Verstappen goes between Kvyat and Sainz into sixth. 12:54 Great run from Perez as he gets another flying lap out of his first set of tyres and goes sixth there. 12:55 "Currently P1, 0.1s to Nico," Hamilton is told. "Put that last bit of wing in," he responds, estimating that there is a little bit more to come from that change for the second runs. 12:55 Raikkonen has brushed the wall at Portier, he says. He's been struggling there throughout this session, complaining of oversteer at the same corner earlier. 12:56 Hamilton leads the field back out of the pits for the final pole shootout with three minutes left. 12:56 "OK Checo, obviously we don't have any new sets, so we'll have to sit the rest of the session out," Force India tells Perez. 12:57 Perez is the only car sitting this bit out, the other nine are on track. 12:58 Hamilton weaving on the run from Ste Devote on this first timed effort, so this isn't another attempt at pole. 12:58 "Make sure you are weaving and generating tyre temperature as much as possible," Red Bull tells Kvyat. "Track temperature dropping." 12:58 No improvements from the frontrunners yet, these are build-up laps before they go for it. 12:59 Very aggressive attempts at tyre warm-up from Vettel on the run to Tabac. 12:59 Raikkonen is first to find more time and moves up to fifth. He has time for another lap too. 13:00 Hamilton does the best middle sector yet, Rosberg doesn't seem to have a response. 13:00 Hamilton improves provisional pole to a 1m15.098s. 13:00 Rosberg aborts his lap, pole belongs to Hamilton. 13:00 Rosberg reports that he's coming in. Vettel says he's locked up at Turn 1. 13:00 Kvyat, currently sixth, is the last man improving on track. 13:01 Kvyat gets ahead of Raikkonen for fifth, a big breakthrough in the Russian's tough season. 13:01 Rosberg had another big lock-up at Ste Devote, although unlike in Q2 he managed to keep the car on track. But the damage was done, and that released Hamilton to take pole unchallenged. 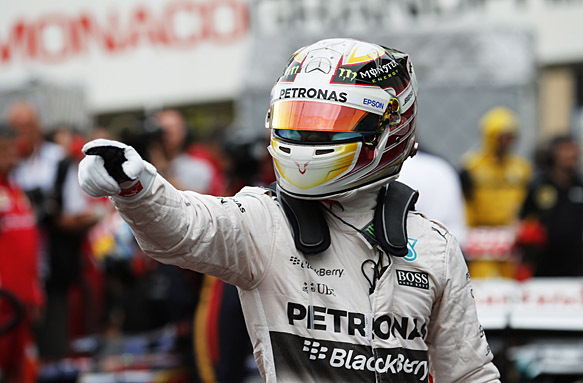 13:02 "Awesome work there Lewis, three tenths to Nico," Mercedes tells the world champion. 13:03 "OK, not bad, not bad. 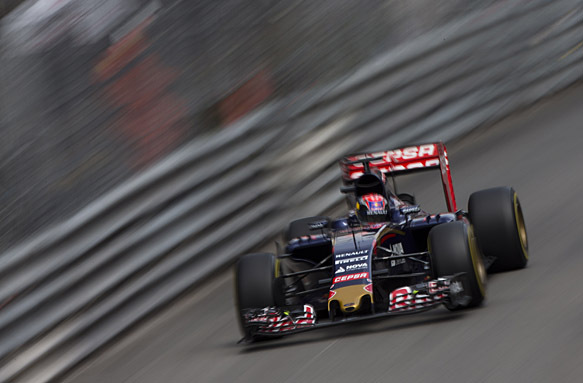 Not great, but not bad," Sainz says in eighth. 13:03 "For some reason it seemed to get worse and worse in qualifying, so it was difficult to get the maximum," says Vettel. 13:06 Grosjean (11th), remember, has a five-place grid penalty for a gearbox change. 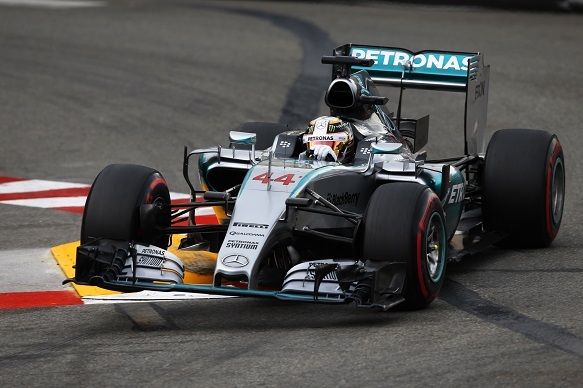 13:13 That was Hamilton's first ever pole around the streets of Monaco. 13:15 Hamilton: "It's been a long time coming. I can't express how happy I am. It wasn't the easiest session, I had a lot of things that can throw you off the rhythm, and I wasn't happy until the last two laps. It's incredibly special. "At this track it's so hard. We've been here for years, but getting your head around it, and continuing to improve is really important. It's like climbing a ladder, and if you slide down it can be hard to get back up. It wasn't easy, so it makes it even more special than if it was back-to-back good laps all the way through." 13:16 Rosberg: "The opposite to Lewis, I had a good rhythm starting off in qualifying, then lost touch a little bit towards the end. I knew I had to go for it because Lewis is quick, and it didn't work out. That's it. "It was very close, and I was confident that I could improve. I changed the balance and I was confident it would come my way, but it didn't." 13:17 Vettel: "It was a bit too cool for us today. Everyone was struggling with warming up the tyres, even the super-soft. It was a shame that the sun was hiding behind the clouds. P3 is a good place to start and hopefully we can split the Mercedes have a good race." Our sister service Race Centre Live is about to resume with coverage of the afternoon stages of the Rally of Portugal plus the second Monaco GP2 race and Formula E from Berlin. 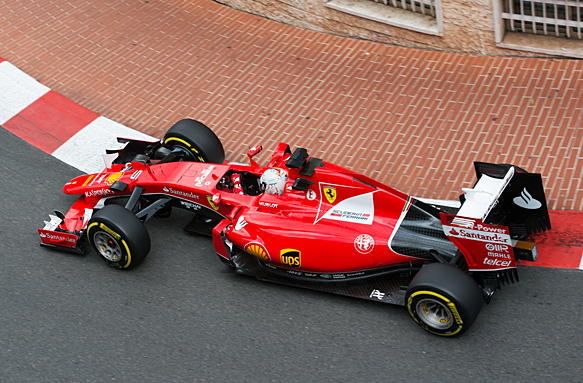 F1 Live is back just before 1pm UK time on Sunday to take you through every lap of the Monaco GP.